UPSC Civil Services Prelims Answer Key 2016 upsc.gov.in: The UPSC CSAT 2016 exam has been conducted successfully as per scheduled on 7th August 2016. As the exam is over, now the candidates who have appeared in the exam, are worried about their result. But before the result is announced, the students can check the answer key of the said exam on the official website of UPSC. The answer key has also been published by some of the renowned coaching centers like Chanakya IAS Academy, ALS, Rau’s IAS Circle, SriRam’s IAS Academy, Vajiram & Ravi and others. Some of the coaching centers have even provided the detailed solutions of all the questions asked so that it would be more convenient for the candidates to check their overall solution. But all the candidates who have taken part in the exam can download the official answer keys as provided by the Union Public Service Commission on their official website i.e. www.upsc.gov.in of all the question booklet series (A, B, C & D) for best accuracy. This will help the candidates to have an estimation about their appropriate score in the exam. 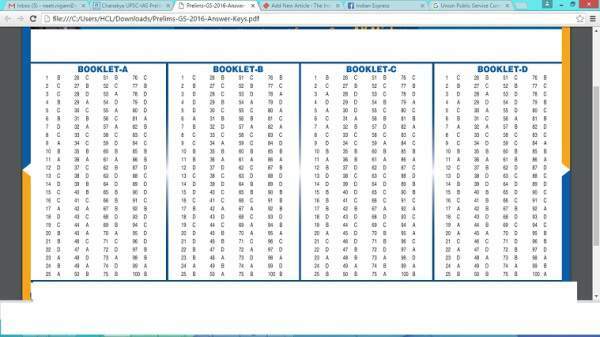 The answer keys for the first session exam i.e. for Paper I (General Studies) and the second session i.e. CSAT 2016 will be published on the official website by the commission by 02.00 pm and by 06.30 pm respectively. Current events, Geography, Indian Polity, Indian history and National Movement, Environmental ecology and biodiversity issues, Development – Economics and Social, General science. Interpersonal skills including communication skills, Logical reasoning and analytical ability, Decision making and problem solving ability, General mental ability, Basic numeracy and data interpretation of Class 10th level such as numbers and their relations, orders of magnitude, charts, graphs, tables, data sufficiency etc and English Language Comprehension skills that too of Class X level. The total score of the UPSC 2016 PRELIMINARY is ‘200’ each Paper1 and Paper2. Each question carries ‘1’ marks. Out of which, a correct answer will lead you to ‘+1’ whereas a wrong answer will lead you to ‘-1/3’ as it has negative marking. Moreover, all the questions in the exam are single-answer, so if someone has marked multiple-answer for a single question, it will be considered incorrect followed by the negative marking. If a candidate has not attempted a particular question i.e. no answer is given by the candidate, in that case, there will be no penalty for that question. It will be simply ‘0’ marks for that question. The minimum marks required for qualifying the Paper 2 is ‘33%’ of the total marks. Check UPSC Prelims answers keys by BYJU’s, SuperProfs, Neostencil. So, the candidates can simply estimate their marks by multiplying the total number of correct responses with ‘1’ scores and reducing the total product of the number of incorrect responses with ‘1/3’ marks from it. i am unable to check the result..